Ask fellow campers about "Mississippi Palisades State Park" and nearby attractions. Nice large CG with electric only sites. Multiple places to fill water tank and 2 dump stations. Had site 46 which was level and nice. Lady running the booth could be a little more happier and personable. Overall great state park. We camped at Mississippi Palisades State Park in a Travel Trailer. Mannys has great pizza and tacos. Must check out scenic overlooks in state park. The positives: spacious sites, very helpful on the phone, many picnic shelters for groups, paved interior roads nice for bicycling, and the river overlooks are nice. The negatives: power, many people in our group of 15 rigs had problems with the power cutting off sporadically. The limit on our 30 amp supply was 24 amps and we exceeded that once. After that, it kept cutting off after the air conditioner had been running for 10 to 20 minutes. Another person had similar problems, switched to the 20 amp on the same post and it ran fine. He thought it was a faulty ground. I don't know if the 3rd person solved his problem or not. The other things are minor. We did not hike because of turkey season (mid-April to mid-May). You can hike after 1:00 pm but by then it was too hot. Also, $20 seems like a lot for electric only, especially since it was not reliable. Many of people have commented on the trains, and they are frequent. We heard them but it did not bother us. We camped at Mississippi Palisades State Park in a Travel Trailer. "Average" for a State Park camping experience, in my opinion. We reserved ahead through the Reserve America app, host was friendly and had our info ready to go when we arrived. She offered firewood, and asked about water before sending us on to our site. Navigation in the park was a little tricky but we made it with only 1 wrong turn. The camping loop itself was pretty typical for a state park in the Mo/Il region. back-in spots with electric only, lots of big trees and a decent amount of breathing room between spaces. If you have rooftop solar you probably won't get much use of it here. Had to drag the heavy the picnic table out of the parking spot before backing in, and clean up trash left behind by the previous occupants. It was a holiday weekend and very full, with lots of large camper units and children running around. The evening and night however was very peaceful, with a few sites hosting groups of people outside showing movies projected on large screens. We never used the public toilet/showers so cannot comment on that. Leaving in the AM we chose the dump station inside the park and didn't have a wait. As we passed the entrance station however, there were several rigs waiting in line and one nearly blocking the exit for everyone else. Luckily our 21' Class C was small enough to navigate the other roads in the park and we were able to drive up to the overlooks and trails over the river valley. I wouldn't want to try the roads in a larger rig though, due to some low-hanging branches and the twisty steep descent to the South Entrance. 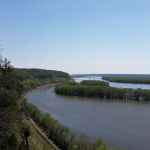 We camped at Mississippi Palisades State Park in a Motorhome. Head for the interior dump station if it's been a busy weekend. Don't try to drive up the road to the overlooks in a big A or 5th Wheel / long trailer! We chose a non-electric site as the electric sites were jacked up to $30 (from $20) for the Labor Day weekend. This could be a nice park with more staff and more maintenance. They also need more bathhouses and more regular cleaning (hubby found "doo" in the shower. Lots of bugs (not mosquitoes but annoying). We camped at Mississippi Palisades State Park in a Travel Trailer. Use the park map as none of the toads are labeled as to which sites are where. The park is showing its age and the effect of budget cuts. Staffing seems to depend on campground hosts manning the check in booth. Ranger and police presence was very limited. Like all Illinois State Parks, alcohol is prohibited. RV sites were very level and covered with a nice layer of limestone. This formed a driveway ridge and patio area separate from the grassy areas. This ridge became critical and perhaps present by design. We had lots of rain and the campground was covered in pools of water. Being up high at least gave you the opportunity to keep your feet dry. Look for level when choosing a campsite, some of the tent sites looked to be completely on the hill side. RV sites seemed to much better designed. Because of the rain the hiking trails were impassable, but looked very good. Trains were common but far enough distant as to not be annoying. They do use their horns at the nearby crossing at all hours and you will be come acquainted with the two long, one short and one long that will sound with each passing train. The latest I read was 43 trains per day. We camped at Mississippi Palisades State Park in a Travel Trailer. A restaurant and marina next to the boat landing is now closed. The mini market store is a thing of the past and does not appear to have any future. Nearby Savanna has seen better times, once a railroad center and then dependent on the now closed Ordinance Depot. Savanna's current claim to fame is bikers, there can be hundreds or more in town on a weekend. Some stay in the campground, some pass on the highway and some are loud. Attractive, sprawling, park-like campground (trees but no undergrowth between sites), very spacious grassy sites with gravel parking pads. CG was surprisingly quiet and about 1/2 empty on this weekend before Memorial Day. Rates will be going up this summer, after new state legislation was passed. About 1/2 the sites have electric hookups (20/30 amps); mix of shower houses w/ flush toilets and clean, well-vented pit toilets scattered around the CG. Small camp store in the park & camp hosts in residence; for other needs, the small town of Savanna is about 5 miles south. There's a boat launch & fishing area along the river, across the road from CG entrance. 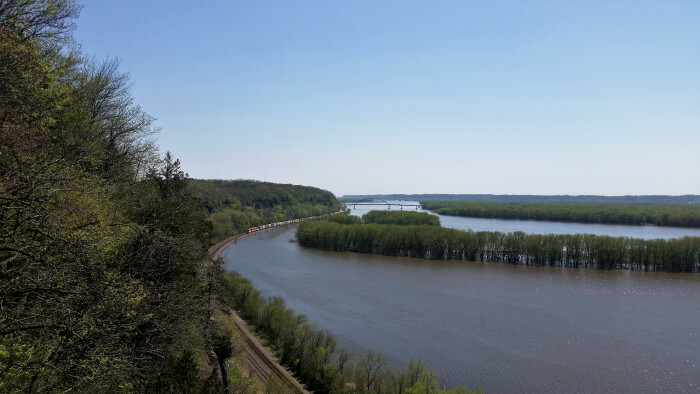 Hiking trails in the woods, some with overlooks along the Miss. River. We really enjoyed this park, and would happily camp here again, even at the new, higher rates (rumored to be $25 later this season). We camped at Mississippi Palisades State Park in a Travel Trailer. Great campground. We camped at site 196, which is a pull through site. The site is at the end of one of the roads, so it was very quiet. The campsites are wide and shady. The bathhouse was very nice and clean. There are easy to moderate hiking trails in the campground area. The more difficult trails are on the south side of the park. I would highly recommend this campground for couples and families. 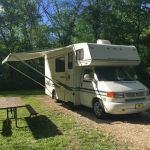 We camped at Mississippi Palisades State Park in a Motorhome. Excellent State Park. Very clean and relatively quiet. Wide open spaces between sites and the grounds are well cared for. The other side of the state park has a bunch of great trails that my kids loved. We camped at Mississippi Palisades State Park in a Travel Trailer. Very nice state park. Big shadey sites, with electric. Small concesion on site. Close to Galena. The only problem I saw was that on Memorial Day weekend the bathrooms were not kept clean. It was very crowded but every time I went into the bathrooms they were dirty. Besides that though the place is very well maintained with a very good ranger presence to keep the riff-raff out. Close to but not on the Mississippi river. We camped at Mississippi Palisades State Park in a Tent Trailer. Are you affiliated with Mississippi Palisades State Park ?